An Accomplished Professional in a wide range of media including television, film, commercials, and live puppet theater. Twenty years of experience as a performer, producer, director, writer and designer of puppets and puppet presentations. to voice-overs for animated segments. Received 2002 Emmy Award for Outstanding Direction in a Children's Series. Received 2004 Emmy Award for Outstanding Direction in a Children's Series. Received 2005 Emmy Award for Outstanding Direction in a Children's Series. 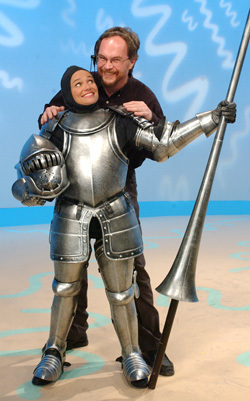 Received 2006 Emmy Award for Outstanding Direction in a Children's Series. A Happy Puppet Production in association with the Disney Channel. Directed episodes for Season One. Supervising Producer and Director for Season Two. Performed the principal character role of "Ben"
the performances of an 8 member team of puppet performers. Directed and performed various puppet characters. A production of the Jim Henson Co./NY. for Best Children's Show two consecutive years. performances of other puppet performers. An Emmy Award winning literacy special. Performed principal character roles of "Baffel"
"Edison the Elephant," "M.T. Promises" and "Gary Gnu." Universal Studios theme park in Japan. through the snack food factory. and built the carnivorous plant, "Audrey II." summer stock, and park performances in the Tri-state area. Aspirations: Would love to find time to earn Masters Degree!